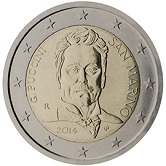 The coin commemorates the 90th anniversary of the death of the famous Italian composer Giacomo Puccini. Puccini composed 12 operas, some of which – La Bohème, Tosca, Madam Butterfly, Turandot, Manon Lescaut – are still among the most staged in the major opera houses of the world. Puccini was fortunate enough to attain fame during his lifetime. A life like portrait of the great composer dominates the inner circle of the coin. Around the edge of the inner circle on the left is “G.PUCCINI” and on the right “SAN MARINO”. The year of issue is at the bottom left and the mint mark at eight o’clock. Finally, at five o’clock, in the form of a ligature are the initials of the designer.